What is a Studio Compressor? What Does It Do? An audio compressor is one of those pieces of gear that everyone tries to get by without for some odd reason. Guitar players, for instance, feel they should be able to achieve the effect with their fingers. Vocalists try to do the job of the compressor by moving closer and further away from the mic. Some mixing engineers will even automate the volume or literally try to ride the fader during tracking. That's all 100% silly, nonsensical, and usually an admittance to not understanding to how to use a compressor. That's a sad situation, because it couldn't be easier once someone takes the time to show you. Sure, there's quite a few knobs for you to tinker with, but honestly most of them are set and forget. And once you have a grasp on what compressors do, then you also understand expanders, limiters, and noise gates! What is a Studio Compressor? An audio compressor tames the dynamic range of your signal so that there is less variance between the loudest portions and the quietest parts. It also provides a way for you to control the manner in which it does this. That's it. It squishes your recorded signal so the loudest parts are 10x louder than the quietest instead of 100x louder. I made those numbers up but it illustrates the point. A studio compressor's job is to pull off this feat in a way that is pleasant for the listener. Naturally a lot of people ask why we care about this. Dynamic range compression is important for many reasons. The main reason we're concerned about is that it helps us polish the audio in music, movies, and television in a way that is not only comfortable for the listener but also brings a greater sense of clarity. This is because the quieter details are equally as important to intelligibility as the loud parts. An analog compressor does this job through manipulation of the electrical signal flowing through your cables, while a digital compressor performs the task through tweaking and changing the binary code of your digitized audio signal. The algorithms and electronic gadgetry aren't important, we'll leave that to the manufacturers. But you'll definitely want to understand how to direct the compressor to do the job correctly, because it's not automatic! Wrap your head around these and not only are you ready to use a compressor but you'll understand how a limiter, expander, and a noise gate works as well! When it comes time to start compressing, you can tell the machine how quickly it should respond. I can fire into gear within as little as 0.2 millseconds or you can delay the response for upwards to 300 ms. Sometimes you want it to wait a second so that a certain nuanced detail can come through uncompressed, such as the initial crack of a snare drum. The time has come for the compressor to stop doing its job and release its grip on your signal. Just like the attack, you can tell the compressor to stop immediately or you can instruct it to hang on for a little longer. Immediately, in this context, is as fast as one or two milliseconds and slowly can refer to as many as several seconds. Sometimes too fast of a release can create a strange pumping feeling depending on the source material while too slow can create fade-outs that abruptly jump back to full volume. So all of this begs the question of "when does the compressor start compressing?" The answer depends on where you've set your threshold. The threshold is a barrier that you set at a certain decibel level. Any time the audio gets louder than that level, compression will begin. For a limiter, no audio can get louder than this level. The choice is yours. The best way to get a grip on using the threshold is to experiment and see how it effects the sonic quality of the signal. There's no right or wrong, but there is better and worse depending on your goals. Finally, the ratio of a compressor tells it how much to compress once the signal has surpassed the threshold in volume. Generally you'll have a choice from between 1:1 and 25:1. One-to-one means no compression is taking place and 25:1 is essentially a limiter setting. Let's use an example of 7:1. This means that for every 7 dB of volume that shoots over the threshold, only 1 dB is allowed to sound out. If 14 dB pops over the threshold, only 2 dB will be allowed to slip through. This is how the volume reduction occurs. Dealing with the four settings above is easy enough, but there are some advanced compression concepts that confuse people. I'll expose them to you with brief explanations so you'll at least be in the know! These three things are types of compressors. Knowing this greatly reduces the confusion and intimidation of studio recording. Limiters: We slightly touched on limiters before. A limiter is basically a compressor with the threshold set at 0 dB and the ratio as high as possible. The goal is to block any sound that is so loud that it will peak and cause distortion. In most scenarios, that's not what you want. 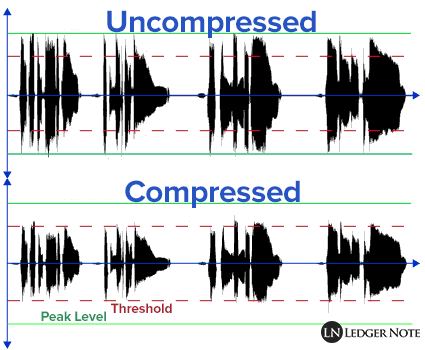 Clipping comes from bad gain staging, but live performers or mastering engineers can find good use for limiters because they aren't always in control of the gain staging. So sometimes they can use one for damage control. Expanders: So think about the how the threshold says "reduce volume above this line." An expander is a compressor that does the opposite. It raises the volume below the threshold. If you ask me, there's never a reason you should be using one of these. There's two reasons for that. Use proper gain staging and a compressor instead of a shortcut. You're raising the volume of the noise floor when you expand. The second point above directly relates to noise gates. Gates: A noise gate works like an expander in that it manipulates the signal below the threshold instead of above it. But instead of turning up the volume down there, it reduces it or shuts it off completely. Imagine that you're recording two rappers in the same booth with two microphones. They are trading 4 bars each and then waiting for their next turn. While waiting, their microphone is picking up the voice of the other guy slightly. You don't want that in there so you set the threshold just above the volume of the unwanted voice and tell it to reduce that sound by 15 dB. Now you don't have to manually deal with it later. This works for live performance in bars and all types of scenarios I'm sure you can think of. People throw the term sidechain around and never get around to explaining it, which makes it hard for someone who doesn't understand it to follow the conversation. It goes like this... Compressors have inserts on the back of them that allow you to feed them a separate audio signal. Let's take ducking as our example. Ducking: Take the case of a news reporter. Her camera man has an ambient microphone recording the sound of the crowd cheering while her personal microphone is feeding directly in via a cable. (I don't know if this is how these cameras actually work, by the way). Let's say there's a compressor on the ambient microphone that's being fed the second signal from the reporter's mic through the sidechain insert. The compressor will analyze the amplitude of the second mic (the reporter) but will apply its compression to the ambient mic (the crowd). So in the end, what happens is that when the reporter talks, the volume of the crowd is reduced so that it ducks out of the way and is less loud so that you can hear the reporter more clearly. Mixing engineers use this technique a lot, especially when mixing a kick drum and bass guitar or bass synthesizer together. They make the bass duck out of the way of the kick. Ducking is a way of automatically riding the gain on specific tracks (as is compression as a whole). De-Esser: Another common example is that of a de-esser, which serves to handle the issue of sibilance (the piercing and loud hiss that happens when people pronounce consonants that feature the letter 's'). By connecting an equalizer to a compressor you can determine exactly the small frequency range that screeching sound is in and compress only it back down to tolerable levels. Microphones are sensitive and will pick up these small bursts of pressure and convert them into loud audio. A de-esser will solve it! Lastly, there's the concept of parallel compression. Sometimes you want to preserve some dynamics while still making sure the quiet parts of your audio can be heard. What you can do is have a version of the signal that isn't compressed at all and combine it a version that's heavily compressed. This turns up the volume of the quiet parts while leaving the volume spikes intact for emotional effect. It can be used on vocals, drums, guitar, or anything else. You then recombine the uncompressed and the compressed signals into one, and boom you've done parallel compression. Check out our reviews of the best studio compressors at each budget range! If you want to read a list of frequently asked questions on the topic, check out our buyer's guide for the best vocal compressor. Otherwise we've just included the two most common here. Where Does It Go in my Recording Chain? This is a very basic question. If you have concerns with working through the logic on this yourself, read our guide to setting up your recording studio and you'll be able to make full sense out of routing your signal path around. Without explaining the logic behind it, you're going to want your compressor to come after your equalizer. This way the compression isn't being triggered by loud frequencies you want to remove anyways. Get rid of those first with an EQ. Also, a compressor should come before time-based effects like reverb and delay in most cases. There are some tricks related to parallel compression but you'll discover those later. Is there a difference between a plugin and a hardware compressor? At this stage in the technology game, they both will do the job perfectly. This leads to the question of why you would buy a hardware compressor at all. Plugins can be used on 100 tracks with one license and are generally cheaper. But they lack one aspect that a lot of musicians and mixing engineers seek, and that's analog components. There are two types of compressors: transparent and colored. You can assume all software compressors are transparent as well as most solid-state hardware ones. Colored compressors are solid-state ones with transformers and the old kind with vacuum tubes. The term color refers to a pleasant saturation effect that is added to your audio signal by these components. The saturation is made up of quiet harmonic distortion that creates a sense of warmth and fullness. While there are plugins that attempt to emulate this feeling, nothing beats the real deal. And also there's the consideration of live performances where a plugin won't help you. There's also the people who like to mix hands-on instead of just in the computer. Clients are generally impressed by the knowledge and skill it takes to use all this crazy-looking machinery and are amazed at their mere presence. It's good marketing to have one (or twenty), basically. That's it. At this point all that's left for you to do is play with a compressor. Knowing what each knob and setting does is one thing but hearing their effects is where it'll really start to click for you. Fire up your digital audio workstation and use a plugin to get the hang of it. If you decide you like it, I highly recommend having at least one solid, physical compressor in your main signal path! Now when someone asks you "What is a studio compressor?" you can answer (or send them here! ).